Classic puzzle game Tetris reaches the ripe old age of 30 this week, and while it might not have cutting edge graphics or fancy Kinect integration the puzzle game is still going strong. After all, how many hours have you spent in your lifetime perfectly fitting together the tetrominoes that make up this puzzle game? 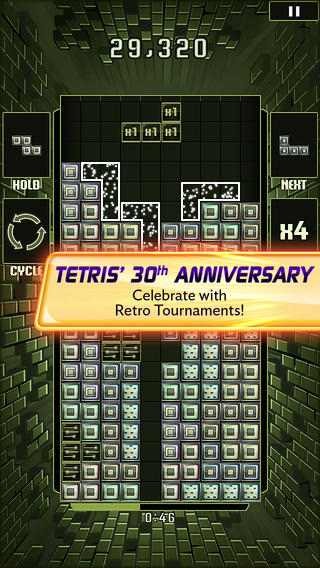 Though you might not have a Commodore 64 or GameBoy to play it on anymore, Tetris lives on as the Tetris Blitz mobile game for iPhone, Android, and Kindle. But before you download it, be warned that it's just as addictive as it was 30 years ago. To celebrate the game's anniversary, Tetris Blitz has added an 80s-inspired skins, power-ups, finishers, and a sound... and even a some virtual birthday cake to complete the festivities. If you'd like a more real-world celebration of your Tetris love, join in the We All Fit Together birthday event on June 6th or join the July 20th as Tetris fans in London attempt to break the world record for the largest human Tetris gathering.